Remember how The Times of London was offering a cheap Nexus 7 with a new digital subscription? The Financial Times has gone one step worse. This Pearson subsidiary has just announced a new bundle offer. It's only open to new US subscribers, and you'll need to subscribe to the premium digital or hybrid print/digital subscription. It's only good for the next week, but if you act fast you can take advantage of this lackluster offer and get a free (outdated) Nexus 7 8GB model. The registration buttons don't seem to be working, so I can't judge the relative value of this deal, but from what I can see so far it has me scratching my head. 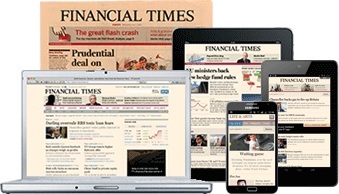 The FT has always seemed to be one of the few publications to really understand how to turn a buck in digital content. I've been following the publicly released details about their financials for some years now, and The FT has usually reported increases in digital subscribers, digital revenue, as well as a generally healthy pocketbook. And then they pulled this out of their hat. I don't understand why they didn't offer a better deal. At least The Times of London offered the Nexus 7 with the most storage, though they did have to charge extra. This offer more closely resembles the one from the Philly newspapers, the one which never did have all that much success. It's been well over a year since that program launched and they are still inviting people to be among the first 5k to sign up. I'm not sure whether that is proof that the program was a bust or that the newspaper management doesn't care about the program, but I suspect if the program had been working out then it would have been updated to include a tablet which was not ridiculously out of date. On a related note, Barnes & Noble had a similar bundle offer earlier this year. There's no info on how successful that program was, though I do know that B&N had several missteps in handling the bundle offers as gifts and in delivering the content in a timely fashion. Luckily THJE FT will be delivering content to their Android app, which will come pre-installed on the Nexus 7, so getting the news on time should not be an issue. New $99 Nexus Tablet to Pass on the WonderMedia CPU? I’ve always thought newspapers should have started doing this sort of thing a good 15 years ago. But who listens to me? The hardware was too expensive back then. And sometimes there were giveaways where you could get a free toaster with a new subscription.